Outeredge is a clean, simple and flexible WordPress Theme suited for business websites, modern and professional blogs, portfolios and project galleries. All theme components are completely responsive and work on any mobile device. Outeredge comes with powerful options: custom colors, extended typography settings with a full set of Google Fonts, customizable header, footer with 2, 3, 4 columns layout, styled set of buttons, versatile portfolio with many presentation styles, custom blog layouts, Google Map integration and more. The theme includes the shortcode generator, built in Revolution Slider, more than 430 Font Awesome icons. All theme components are completely retina ready. 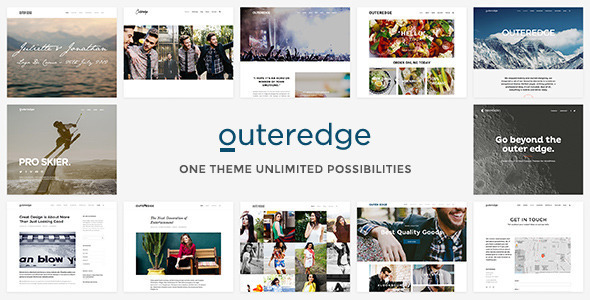 The Outeredge theme supports post types: Standard, Aside, Image, Gallery, Video, Audio, Quote, Link, and Status. This entry was posted in creative, wordpress and tagged blog, business, company, corporate, gallery, lifestyle, modern, multi-purpose, music, photography, portfolio, pruduct, restaurant, wordpress by Acty. Bookmark the permalink.